Thakkali aati kaachina kuzhambu is a popular side dish served with idli in the Kongunad region of Tamilnadu. 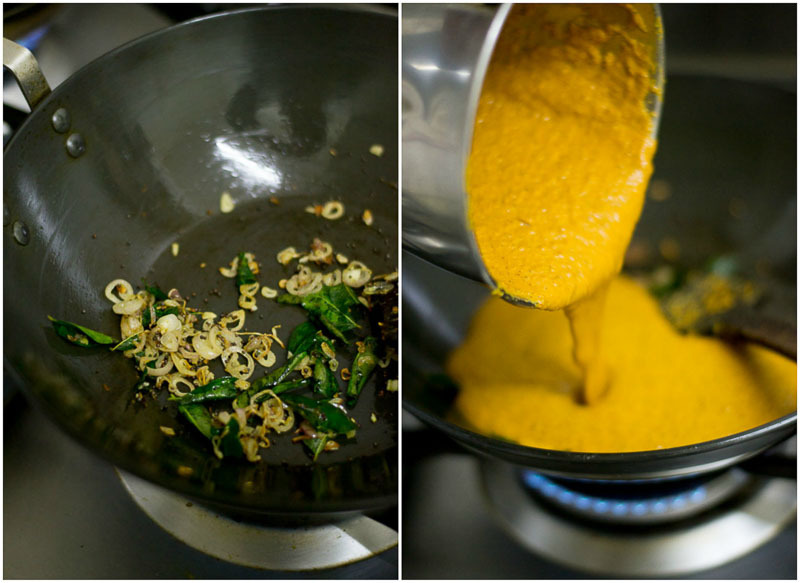 The curry is made by roasting and grinding spices, tomatoes and coconut which is then simmered to form a thick sauce. தக்காளி ஆட்டி காச்சின குழம்பு. 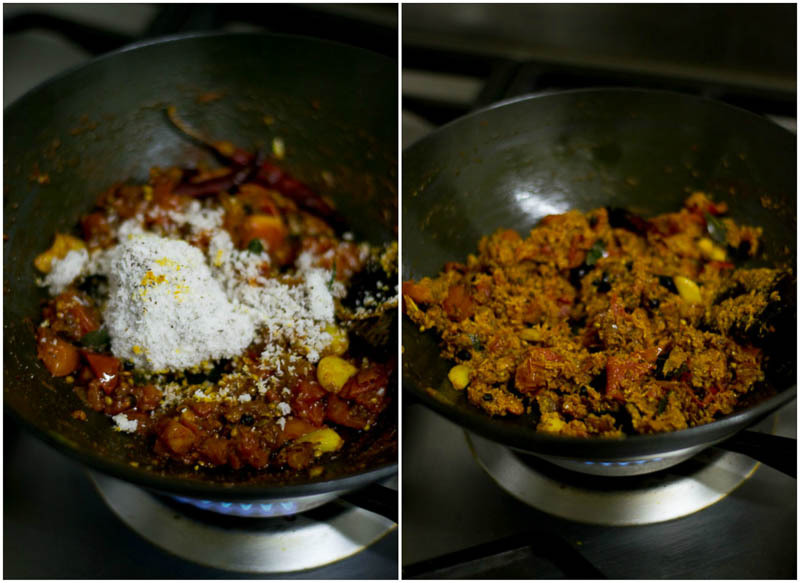 “Thakkali aati kaachina kuzhambu” literally means tomatoes ground and simmered to a thick sauce. This tomato curry is an excellent side dish for idlis and is one of the main staples of everyday kongu cuisine. 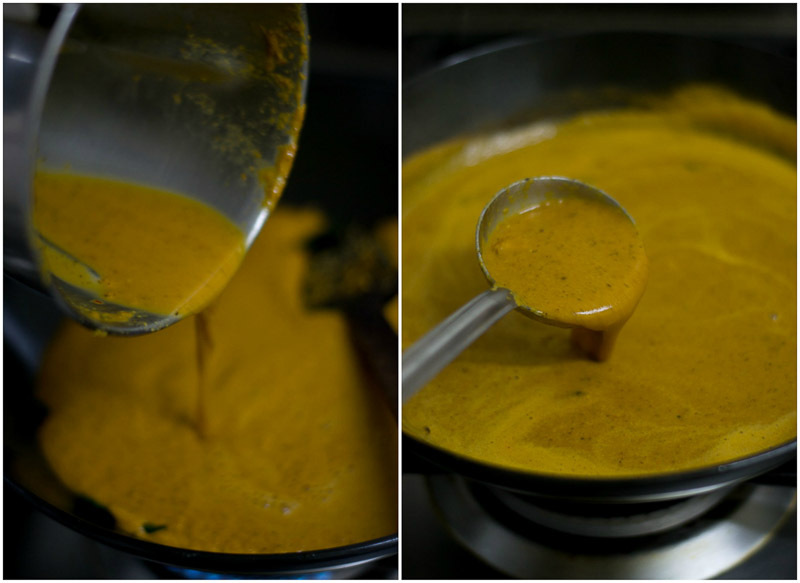 There are different versions of this curry in every home in this region. The spices are roasted in oil along with tomatoes and coconut and then ground to a fine paste. 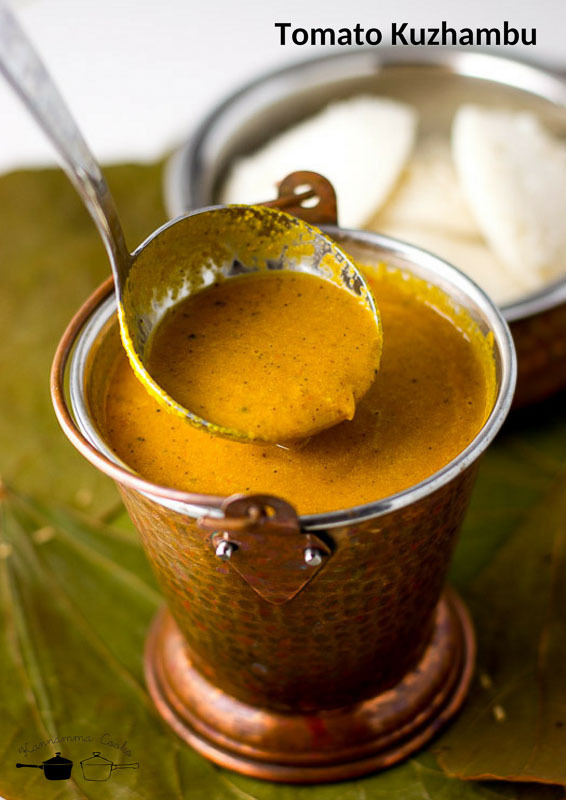 The ground paste is then simmered to form a luscious gravy that is so perfect for dunking the idlis. This curry will definitely appear at the breakfast table if you have guests for breakfast. This is one of my husbands favorite side dish for idli. 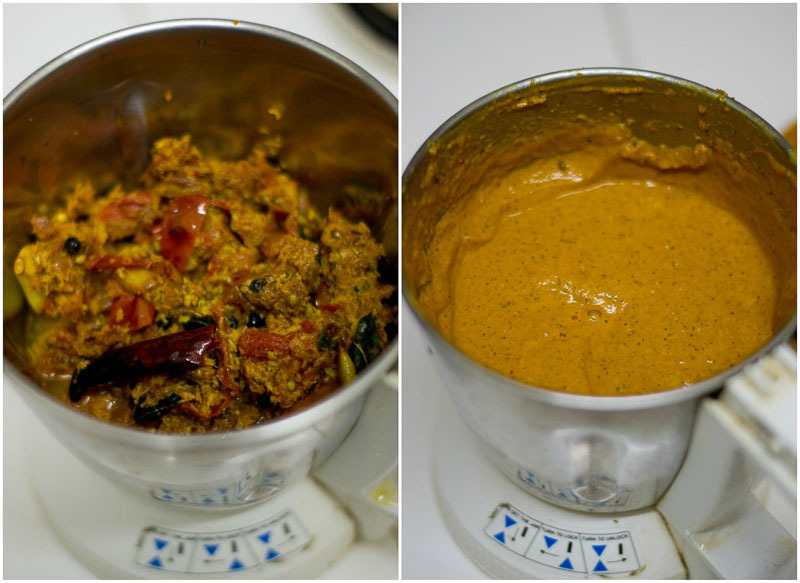 I have shared another variation of this tomato kuzhambu and the recipe is here. Here is how to do Kongu Style Thakkali Kuzhambu. For this recipe, its traditional to use coconut oil or sesame oil (Indian Gingely oil). I like to use coconut oil for this curry at home. 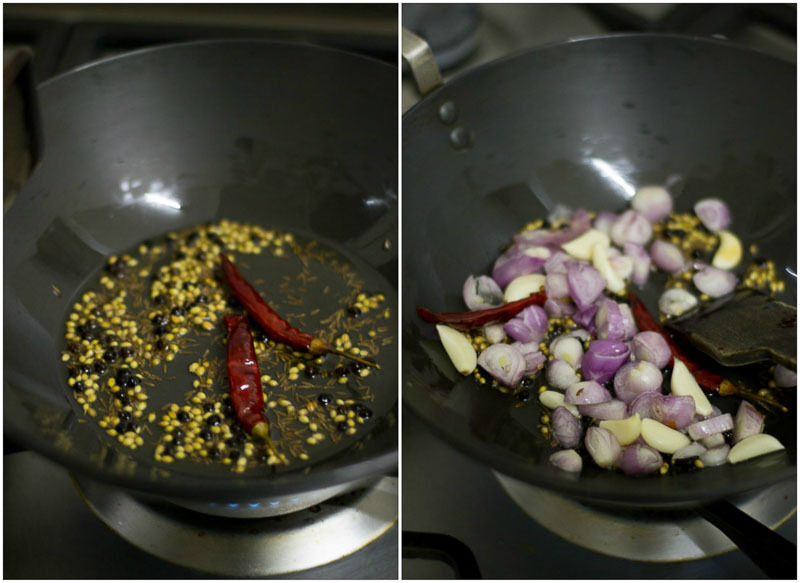 Heat oil in a pan and add in the spices – cumin seeds, coriander seeds, dried red chillies and black pepper. Use the black pepper sparingly else it will over power the curry. 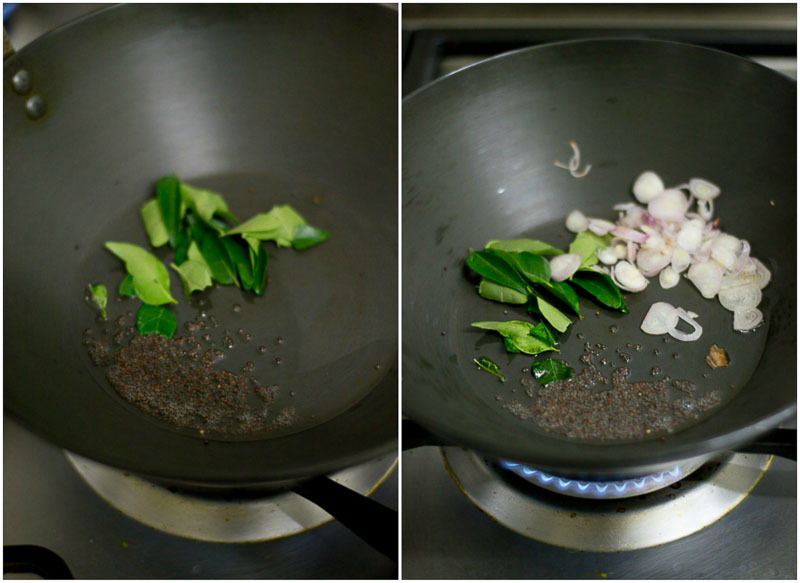 When the spices hit the hot oil, it will immediately become aromatic. Add in the chopped small onions, and garlic. Add in the curry leaves. Saute the onions till its nicely caramelized and brown. 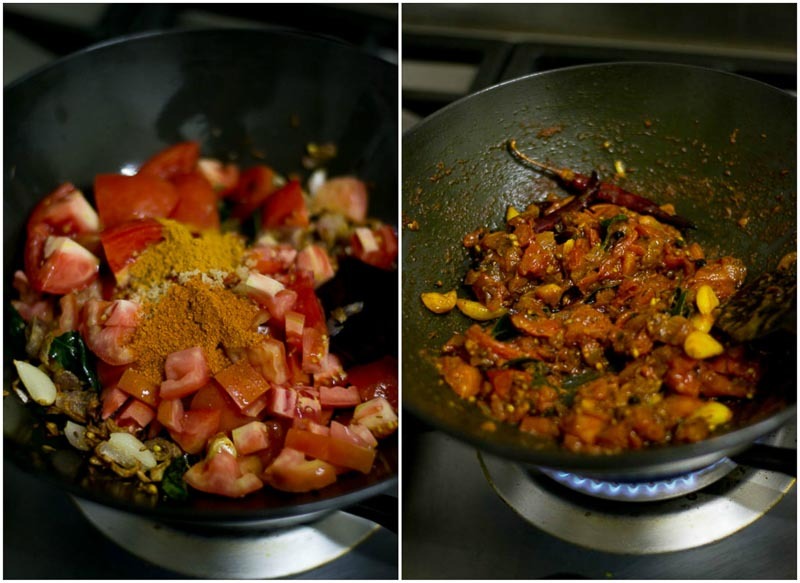 Add in the roughly chopped tomatoes, salt, turmeric powder and sambar powder. Let the tomatoes cook for 5-6 minutes on a medium flame till the tomatoes are cooked and mushy. Add in the fresh shredded coconut and saute for five minutes more. Switch off the flame and allow the mixture to cool. Grind the mixture with a cup of water to a smooth paste. Take your time to grind. It will take 2-3 minutes. We need a very fine paste. Set aside. 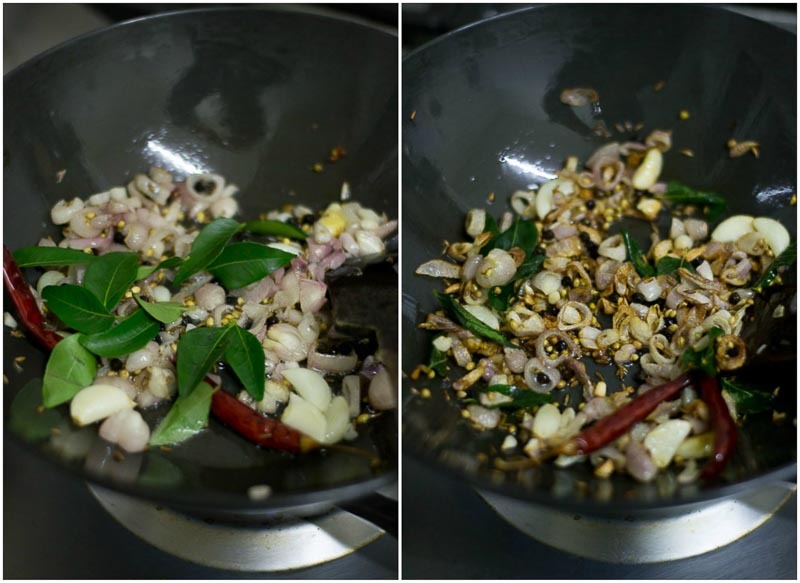 Heat oil in a pan and add in the mustard seeds, curry leaves and finely sliced small onions. Saute till the small onions are nicely brown. Once the onions are brown, add in the ground paste. 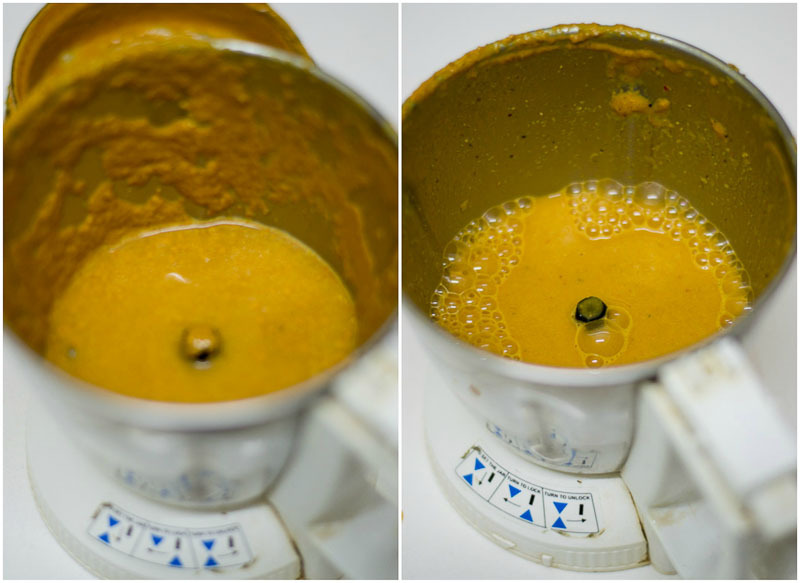 Add a cup of water to the empty mixie jar and wash off all the leftover masala paste and add it back to the pan. Simmer the gravy for 10 minutes. The gravy should not be very thick. It should be like the consistency of sambar. Thakkali aati kaachina kuzhambu is a popular side dish served with idli in the Kongunad region of Tamilnadu. 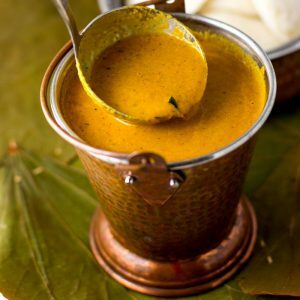 The curry is made by roasting and grinding spices, tomatoes and coconut which is then simmered to form a thick sauce. Heat oil in a pan and add in the spices. Add in the chopped small onions and garlic. Add in the curry leaves. Saute the onions till its nicely caramelized and brown. Grind the mixture with a cup of water to a smooth paste. This has become a favorite at home. I love it. Can’t believe I’ve started cooking fairly decent food. All thanks to your recipes. I’m on your website atleast couple of times a day. Used to be a terrible cook, now I’m pretty good. Thanks much! Lip smacking good. Lovely combination fir idlis!! Wow!!!!!! Excellent side dish 🙂 You know what I like about you Suguna , the below point. I have a recipe request – I once had Kurma style kolambu for Idli, it had potatoes, some Sombu and coconut grinded , after tempered with green chillies, onion & tomato i guess. I tried to recreate myself with the taste but didn’t get the same taste. If you come across something like this can you please make the recipe available in the site? Another Classic Kongu Recipe! Yesterday I made Saravana Bhavan Hotel style Veg Kurma and it was a hit, perfect taste. I have tried many recipes like Tomato Biryani, Chicken Biryani every one of them comes out as how i expect the taste to be! Keep doing the awesome work! Nice variation of my favourite kuzhambu. I add whole garam masala while grinding. Thanks for sharing. Hi Kannama, I have just started to learn cooking. I love Tamil cuisine as I was born and brought up there. I also find it best suits my system. It is really easy to follow your recipes, thanks, especially for the images. All the best. Looks so delicious. I will make it today for idlis! I love your recipes. Kudos yo your passion for cuisines.